The Missouri insurance department found that patients face huge bills and aggressive collection tactics by air ambulance companies. One patient was billed more than $100,000 after being transferred out of state for treatment of encephalitis. Another got a bill for $25,000 after being kicked by a horse, which caused a traumatic eye injury requiring hospital treatment. A third was socked with a bill for more than $24,000 after a trip to a nearby hospital following a motor vehicle accident. Those bills for helicopter air ambulances, which provide emergency services for critically ill patients, were among examples cited in a report released Tuesday by the Missouri Department of Insurance, Financial Institutions and Professional Registration. The report found that air ambulance companies billed Missourians nearly $26 million for services in 2017 – leaving patients on the hook for $12.4 million after coinsurance, copays and deductibles. “That’s kind of a jaw dropper to us in terms of how much we’re talking about,” said Angela Nelson, director of market regulation at the insurance department and head of the team that produced the report. Nelson’s team was unable to say how much of the $12.4 million in unpaid bills was collected from patients. "However, these data indicate that the problem is widespread and impactful on Missourians," the report stated. Many air ambulance services are not “in-network” providers, meaning insurers aren’t in a position to negotiate to keep their prices down. Medicare reimbursement rates for air ambulance services range between $3,368 and $6,404 and Medicaid reimbursements average $2,253. In contrast, private health insurers were billed an average of $41,321, of which they paid an average amount of $23,087. Many air ambulance companies “have adopted fairly aggressive collection strategies, such as placing liens on homes or garnishing wages.” Nelson’s team found 184 Missouri court records since 2012 involving lawsuits by air ambulance companies. The majority were collection actions. In Missouri, 13 air ambulance services operate out of 36 bases, according to the report. That puts most areas in the state within 20 minutes of a base. The largest company is Air Evac, with 13 bases scattered throughout the state. 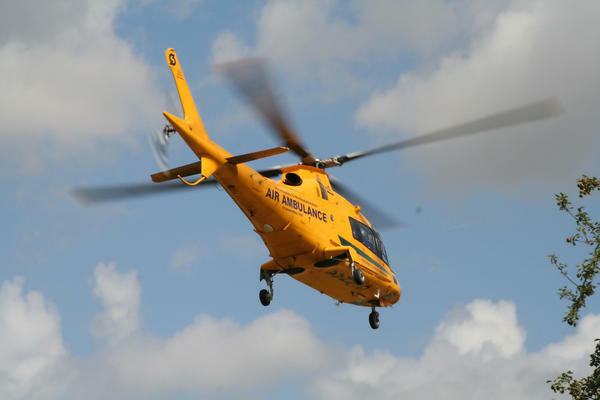 The company was responsible for 3,570 transports in 2017, about a third of all air ambulance transports that year. Other companies include those affiliated with hospitals such as Children’s Mercy in Kansas City. Air Evac’s spokesperson was on vacation and could not be reached for comment. Matt Daugherty, a spokesman for another large air ambulance company, LifeFlight Eagle, said its CEO was unavailable today but forwarded a position statement by the Association of Critical Air Transport, a group made up of air and ground ambulance providers. The group went on to say that it supports federal legislation to enhance consumer protections for air ambulance patients and to amend the Airline Deregulation Act so that states can regulate air ambulance prices, which the act currently prohibits. A report in 2017 by the U.S. Government Accountability Office found that median prices charged for helicopter air ambulance services in the United States doubled between 2010 and 2014, from $15,000 to $30,000 per transport. Meanwhile, the consumer price index increased by only 8.5 percent. Because of insufficient data, however, the GAO was unable to say to what extent patients were dinged by “balance billing." That's the difference, billed to the patient, betwen the provider's overall charge and the insurer's payment. “This idea of hospitals, doctors, air transport providers getting to dictate price that they don't negotiate is unique in health care,” said Dr. Kevin A. Schulman, a professor of medicine at Stanford University. “In every other market, you go to the auto mechanic, say, and they say it’s $20 for an oil change and if we have to do anything else, we're going to have to call you and get you to approve the price,” Schulman told KCUR in a phone interview. Air ambulance companies say their prices are dictated by their high fixed costs and the need to offset low reimbursement rates from Medicare and Medicaid. The GAO reported that officials of one company said operating a single air ambulance helicopter requires a staff of 13 – four pilots, four nurses, four paramedics and a mechanic – in order to maintain round-the-clock readiness and the ability to deploy at any time. On the other hand, as the GAO report notes, air ambulance providers are not subject to the price competition that typically occurs in competitive markets because patients have no say in how and by whom they’re transported and can’t avoid out-of-network providers. Schulman said consumers shouldn’t be held responsible for what he said was an overinvestment in air ambulance supply. “If they made a bad choice as managers in terms of how much capacity they wanted to bring on the market, consumers shouldn't have to bear the brunt,” Schulman said. NPR in September cited the case of Dr. Naveed Kahn, a radiologist, whom Air Evac billed $56,603 for a 108-mile trip to a Fort Worth, Texas, hospital after the all-terrain vehicle he was driving toppled and landed on his left arm. His insurer paid $11,972 after initially refusing to pay anything; Khan was billed for the remaining $44,621. NPR noted that the industry is dominated by a handful of companies, mostly owned by private equity firms, that have expanded dramatically. As a result, too many air ambulances sit idle too much of the time. “I’m not that old, but we didn’t have 13 air ambulance providers when I went to medical school,” Schulman said, referring to the number of companies operating in Missouri. Nelson, of the Missouri insurance department, said her agency is limited in what it can do to bring prices down other than respond to consumer complaints. Since 2013, it has received 128 complaints or questions about air ambulance services, she said, and in 23 cases the department helped them recover a total of $560,000.